If you want to beat the heat this summer, there is no better way than to take a dip in the swimming pool. In addition to making you comfortable, swimming is also a brilliant exercise. However, you ought to stay safe while enjoying swimming. 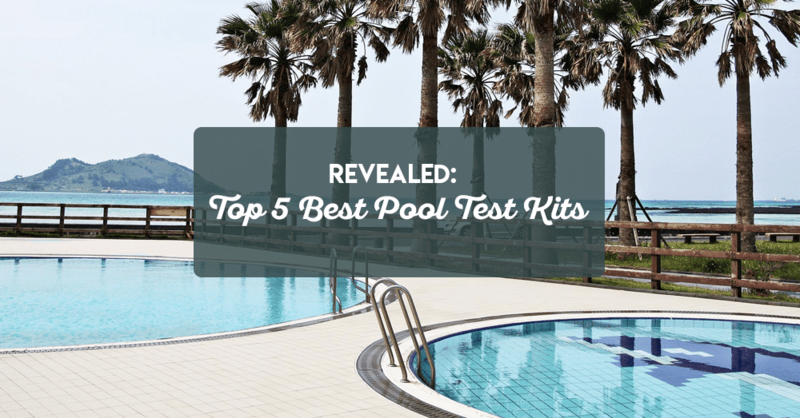 For this purpose, the best pool test kits are essential. While there are many pool testing kits out there in the market, the best pool test kits ensure balanced levels of chemicals in your pool. Consequently, the water quality of your pool will be brilliant and you’ll remain healthy while using it. 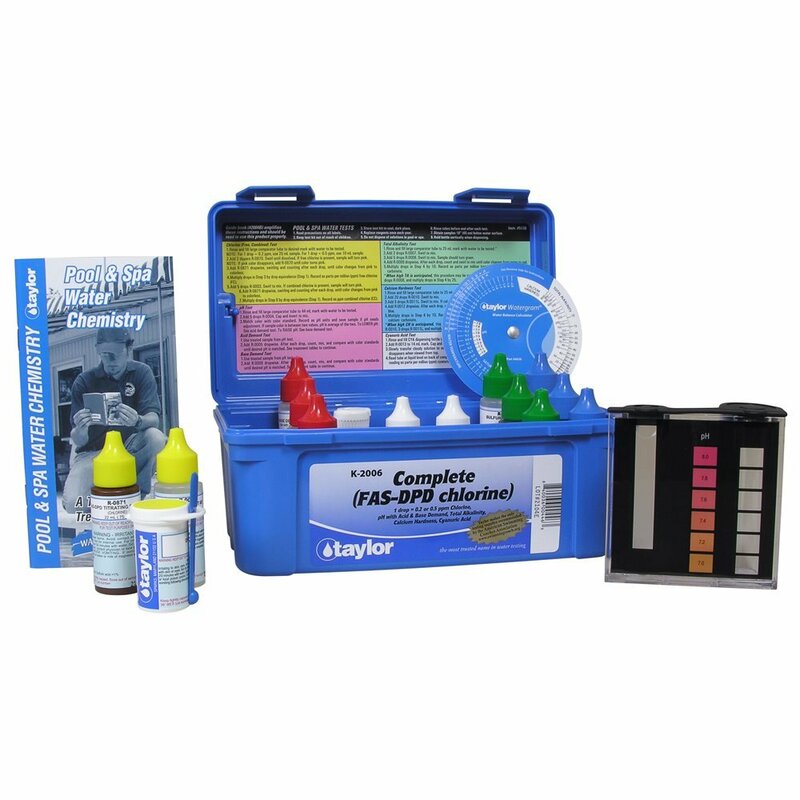 If you want to test your pool water for chlorine, bromine, Acid demand, total alkalinity, and pH levels, the 5-way test kit from Poolmaster is a must-have for you. 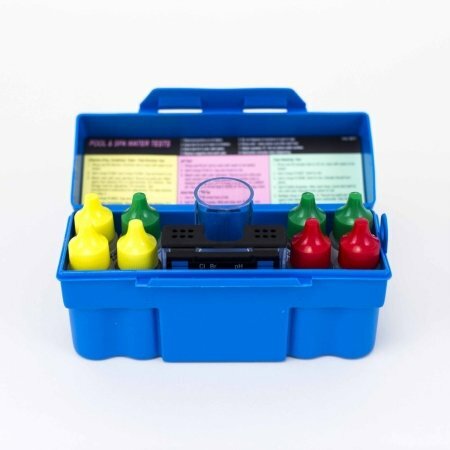 Supplied to you in a polyethylene case, this test kit will give you colored readings which are easy to read. Another thing which this pool kit provides is being the best seller in Amazon rankings. Also, if you have a salt system, a Jacuzzi or an outdoor pool, this test kit will serve all your needs. If you want your pool water to remain healthy while using it, there are very few testing kits out there which could compete with this one. Moreover, as evident by its best-seller ranking at Amazon, this test kit has won lots of hearts. You can get it here. Although it is a bit expensive in comparison with the Poolmaster kit, a mere glance at the ingredients of this kit seems to justify its price tag. While many people might not realize it, the K-2005 Kit is different from its K-2006 successor. While the former uses a liquid reagent for chlorine testing, the latter sides with DPD Powder. As you might guess, DPD Powder is more accurate when it comes to chlorine testing. Looking at its range and this kit tests for pH, alkalinity, chlorine, cyanuric acid, and calcium hardness. Another important substance – which isn’t a part of this kit, but, comes for free with it, is a chemistry book. This book will help you in deciding the optimum concentration of chemicals for your pool. In addition to performing the 5 basic tests, this pool test kit also does really well to do cyanuric acid tests. Hence, while it is a little costly, its manufacturer has provided extra incentives to justify its price tag. You can get it here. Being the least expensive kit of this article so far, this kit is known for its hassle-free usage. While it doesn’t take into account the 5 basic tests, this kit tests 3 important factors: Total Chlorine, pH, and Two-way OTO. As you might have incurred yourself, this isn’t the kit which tests for ALL factors. Rather, it takes into account only those which are most important. Moreover, if you look at the meager price at which this kit is available, it can only do so much. Doesn’t allow to test for Bromine levels and cyanuric acid. 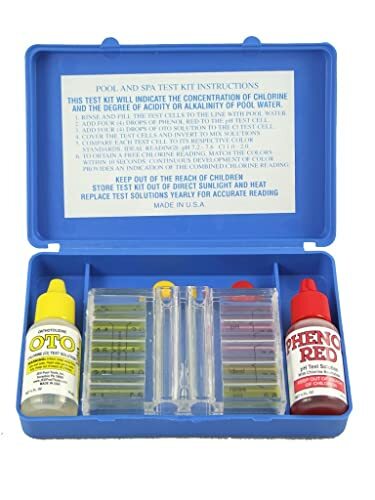 If you don’t care much about Bromine levels and cyanuric acid, this test kit will give you huge comfort when it comes to pool testing. You can get it here. If the color matching kits don’t satiate your appetite, LaMotte offers a photometer to make your life easy with digital readings. All you have to do is to dip the kit in the water and test for the desired chemical using the photometer. In addition to going for the 5-basic tests, it takes into account the cyanuric acid and hardness levels of calcium. Apart from the Cyanuric acid test – which used tablets, liquid reagents are used in testing for the other factors. If you are willing to pay over the odds for a testing kit, the LaMotte Pool testing kit is the best one out there. 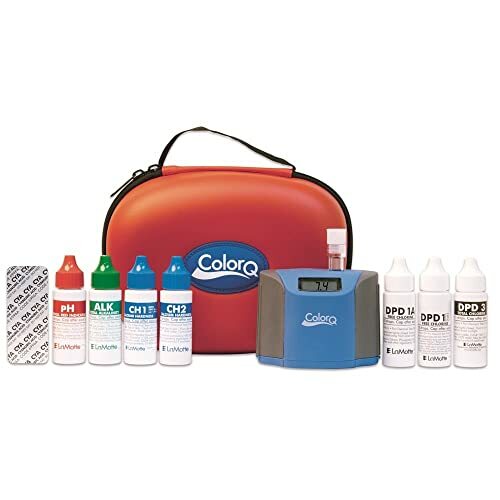 In addition to saving you from the hassle of matching colors, this pool testing kit is very effective when it comes to testing. All in one, a brilliant testing kit provided you have deep pockets. You can get it here. As a glance at this testing kit might tell you, it doesn’t have the outer appearance which other best pool testing kits carry. However, while it is inexpensive, it is not ineffective. 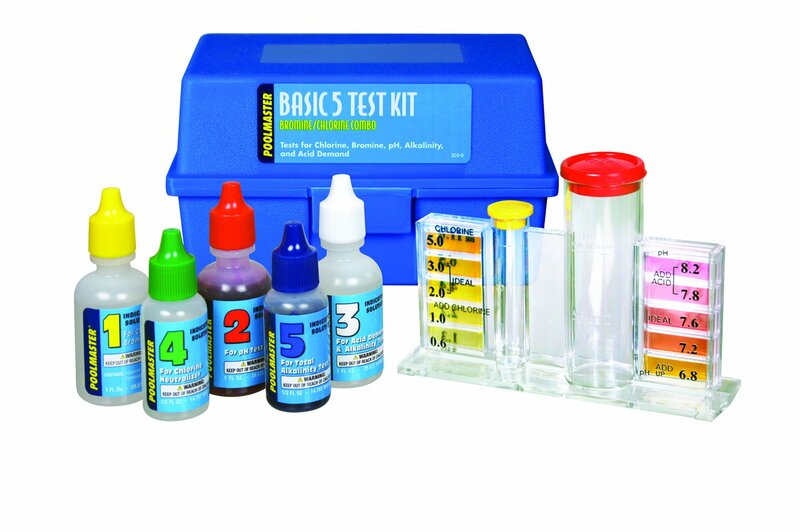 By testing for total and free chlorine, bromine, Acid Demand, Total Alkalinity, and the pH, this kit will make water testing a cinch for you. Moreover, on the back side of the instruction card, there is a dosage chart which introduces you to the follow-up procedures after you have carried out the tests. Might be difficult to separate shades of pink from red. Hence, the values of chlorine testing might be difficult to read. If you are not the man of technicalities and want a pool testing kit which works the same way, you will like this pool testing kit. You can get it here. For a pool owner who has tried a myriad of kits over the years, it is safe to say that I wasn’t impressed by most of them. However, after detailed research, I was able to carve out the above mentioned 5. Among these 5, the one which suited my pool the best – and the one which I still use, is the LaMotte 2056 ColorQ test kit. In addition to all the other features, the one which impressed me the most was its photometer. It is simple yet effective. However, if you don’t agree with my choice, please feel free to give your suggestions in the comment box. May you find this article about the best pool test kids useful. You could also check out about Best Pool Shock.